Row, ski and/or ride 100,000 metres or 200,000 meters from November 23 to 11:59 p.m. December 24. Indoor rower, SkiErg and BikeErg metres only (no on water/on snow meters please). You can combine metres from each machine to reach the challenge goal. Note: Note: BikeErg metres are counted as half when applied to the challenge. Learn more about BikeErg metres below in How To Participate. Support great causes with your metres! Read about this year’s charities below. The Kids' Holiday Challenge allows kids (aged 16 and under) to participate at 50,000 metres. Deadline for entering metres: 11:59 pm GMT (6:59 pm ET), January 4th. There's also a charitable giving aspect to the Holiday Challenge. 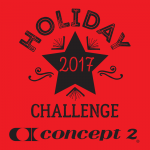 Here's how it works: For every person who rows, skis or rides 100k during the challenge, Concept2 will donate $.02 per kilometre (1000 metres) to your choice of this year's charities. Once you get beyond 100k, we'll donate $.04 per additional kilometre. In order for your metres to count, however, you must choose a charity from the front page of your Logbook (or select "Let Concept2 Choose" if you don't have a preference). For kids and adaptive participants, the $.04 rate will take effect at 50k. Note: BikeErg metres count for half the distance when calculating your Holiday Challenge metres and any related donation. Looking forward to seeing you all get involved!